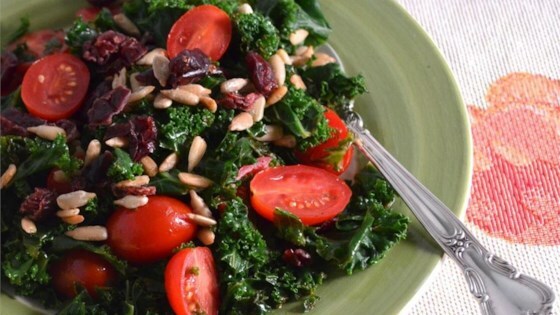 "Delicious kale salad pairs well with just about everything!" Whisk lemon juice, canola oil, olive oil, sugar, salt, and black pepper in a large bowl. Add kale, tomato, sunflower seeds, and cranberries; toss to combine. i give 5 stars to this recipe, because i pre-cooked the Kale to make it little soft. This is super yummy! We added crasins and feta cheese. Those adds made the flavors balance out and all come together.